This is a pretty common problem with NTEventLogAppender (both log4j and log4jna versions) on Windows Vista, 7 or 2008. I’ll use the demo project in log4jna to demonstrate what’s going on. First, configure log4j.properties with an NTEventLogAppender and a new event source name (“demo” in the example below). Run the demo as a non-admin user (if you have log4jna source you can do ant run). It fails with the following error. [java] log4j:ERROR Could not register event source. [java] com.sun.jna.platform.win32.Win32Exception: Access is denied. 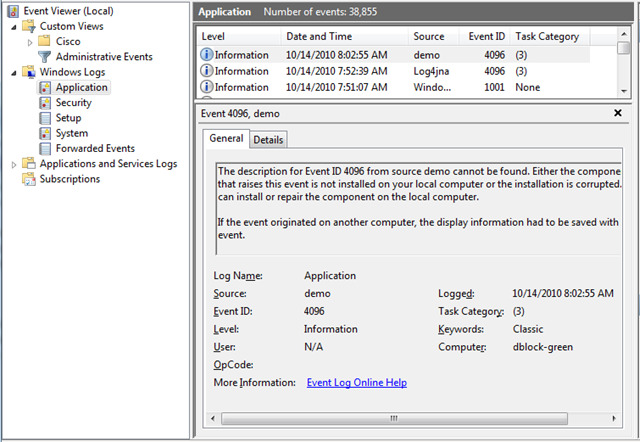 Windows Event Log requires a registered event source to fire events to. The NTEventLogAppender attempts to create one automatically, but doesn’t have enough registry permissions to do so. In order to run software as a non-admin, we must create the registry key at software installation time when we do have those registry permissions. In our case, we need to create a demo key under HKEY_LOCAL_MACHINE\SYSTEM\CurrentControlSet\services\eventlog\Application. This is sufficient for the application to run and to fire an event without errors. I’ll explain what’s going with the event text in my next post. log4jna: log4j:ERROR Could not register event source (Access is denied.) was published on October 14, 2010 . See a typo?